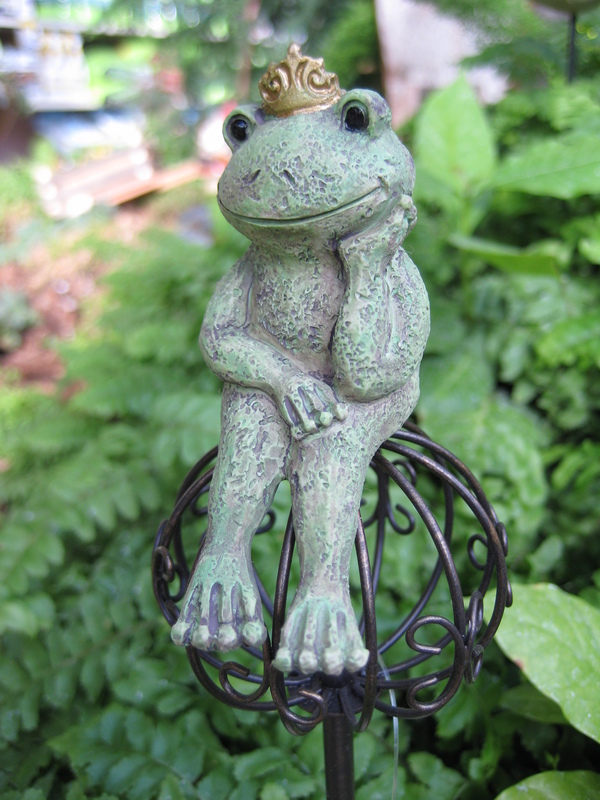 The frog king looked down on this miniature garden paradise and decided he needed a caretaker. So he added a farmer. 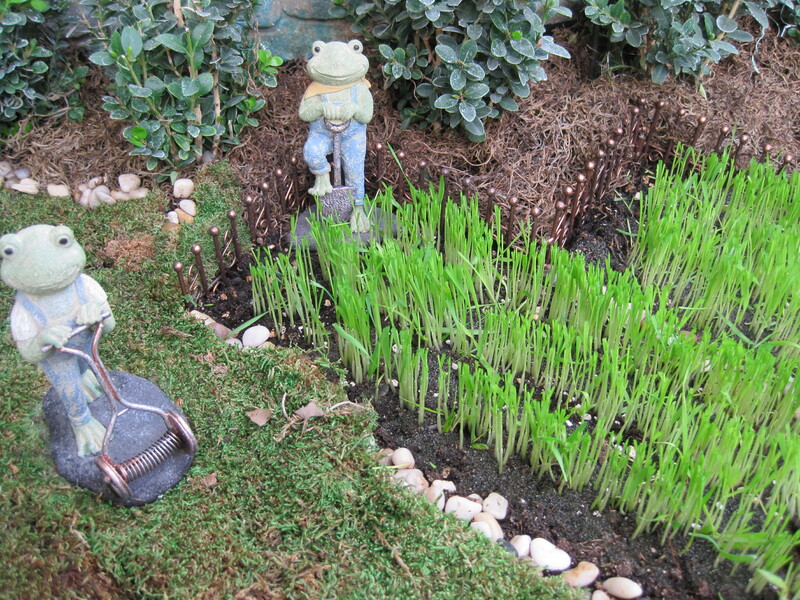 And other frogs joined in to help farm the spring wheat crop. 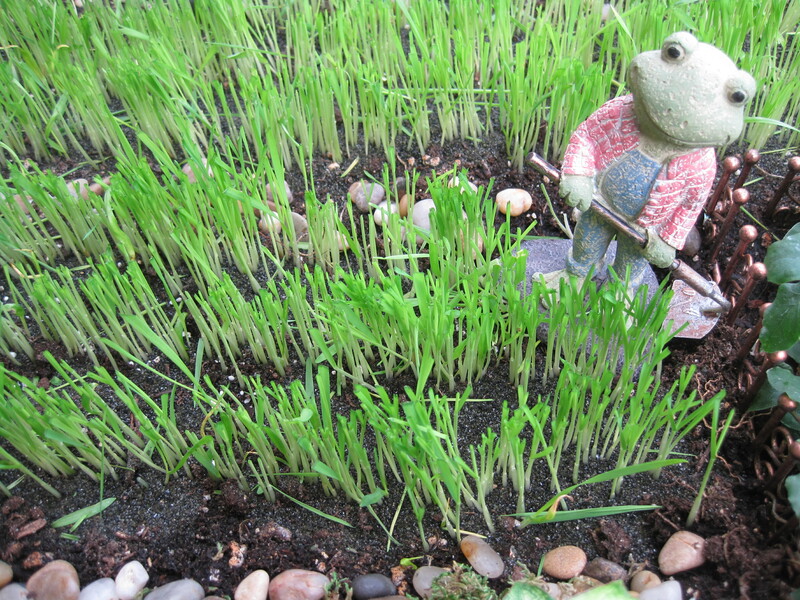 And soon an entire frog village sprang up and they all worked together to farm the spring wheat. 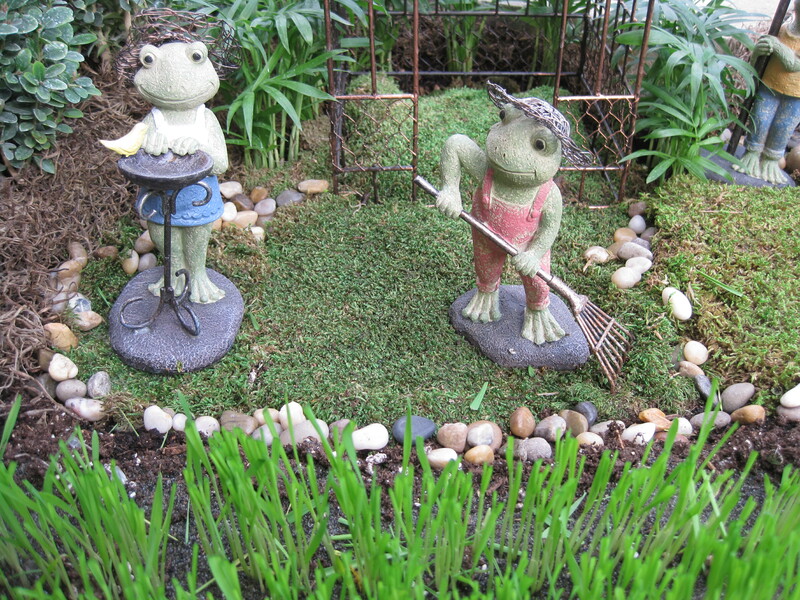 Visit this miniature spring wheat farm in person at Otten Bros. Garden Center and Landscaping, or, find these frogs available online at shop.ottenbros.com. 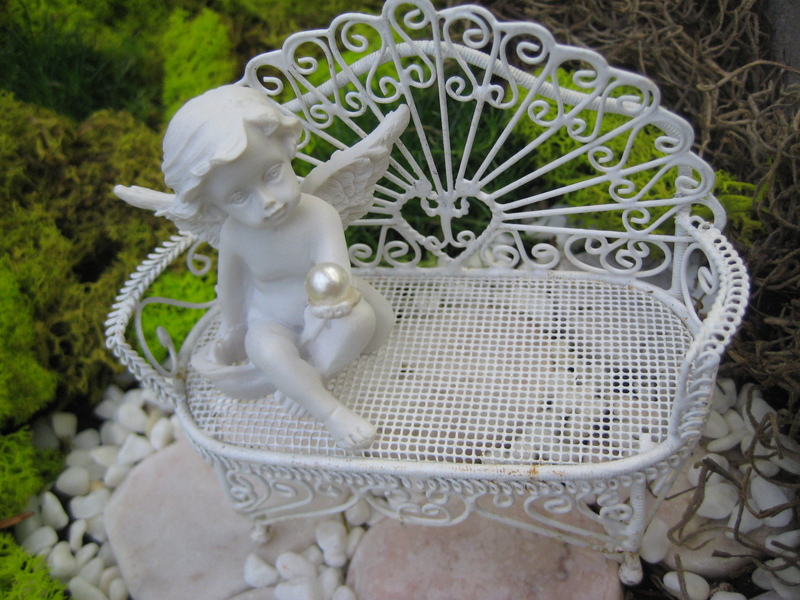 For a formal look in your miniature garden, decorate with white. Begin at the front door. 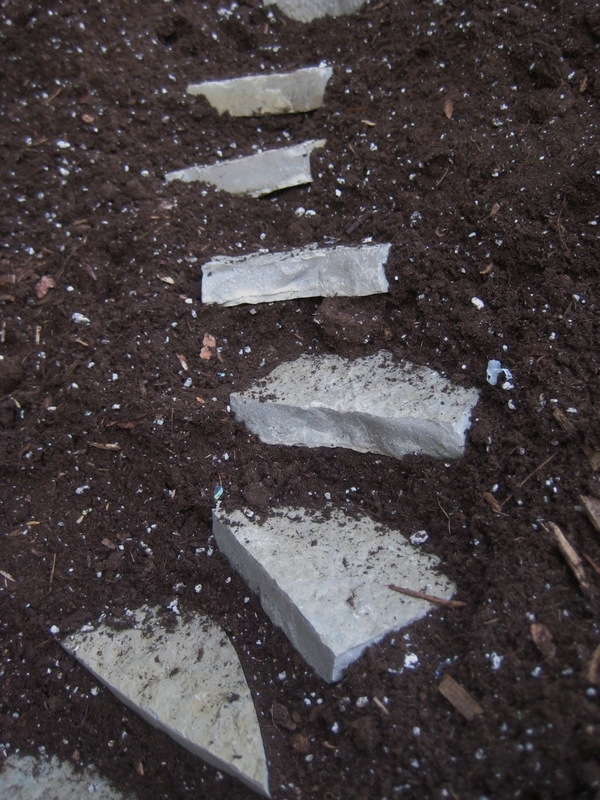 Create a white stone path for fairies and gnomes. 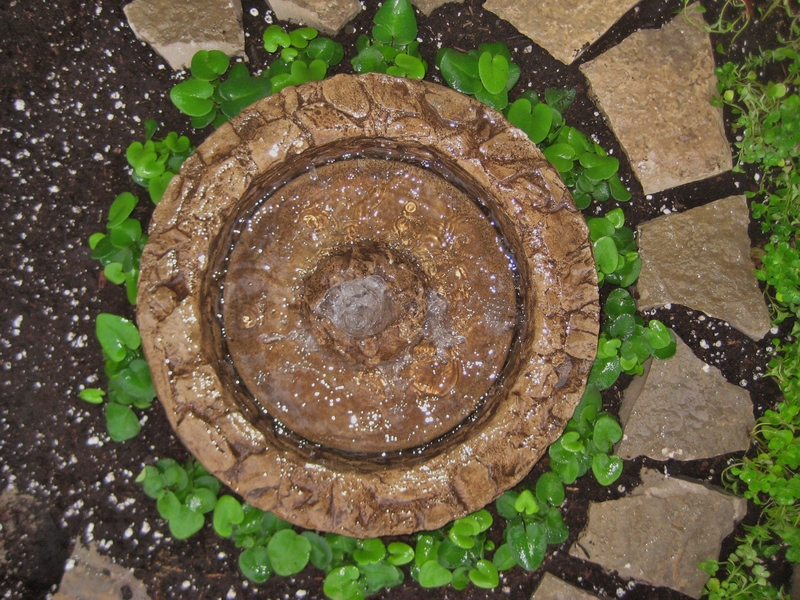 This path runs past a fountain where a fairy is resting. to a lake and gazebo in the distance. 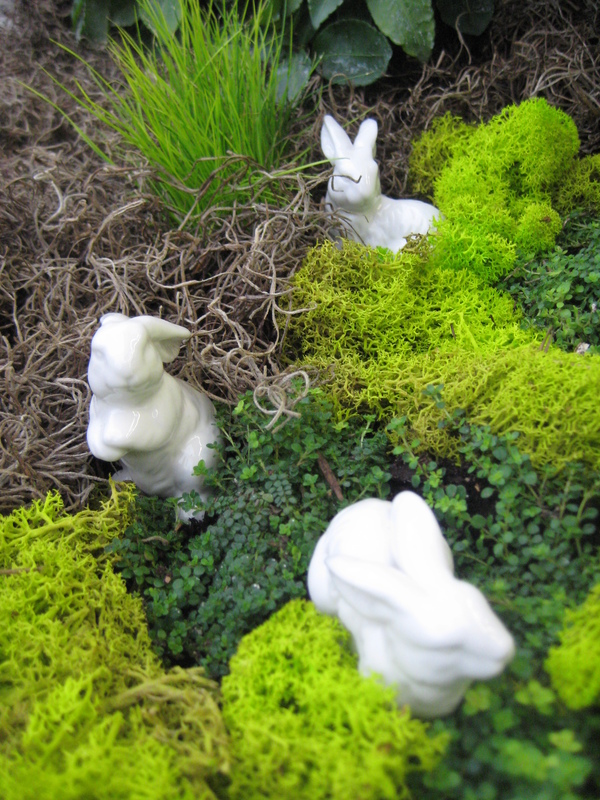 while several curious bunnies peek out of the bushes. The gazebo is a comfortable place to rest at the end of the path. 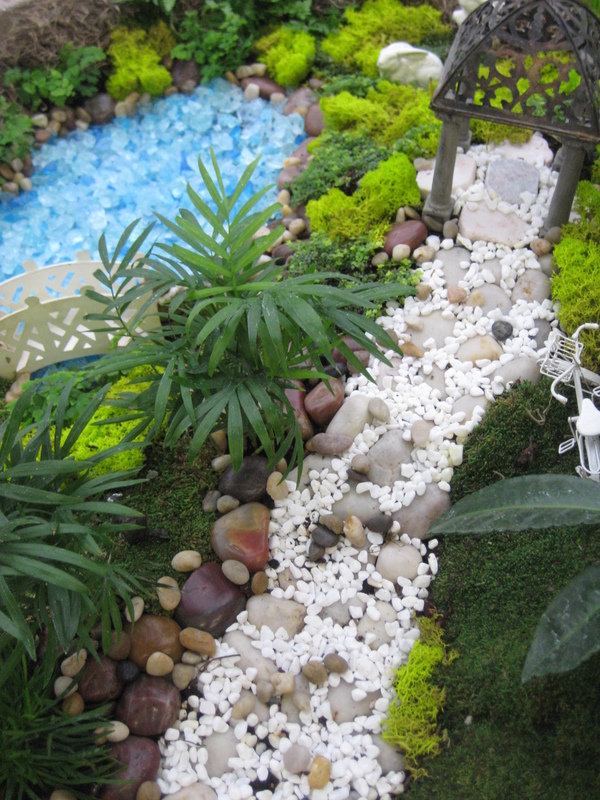 A pristine white miniature garden creates a magical experience for all who happen upon it. 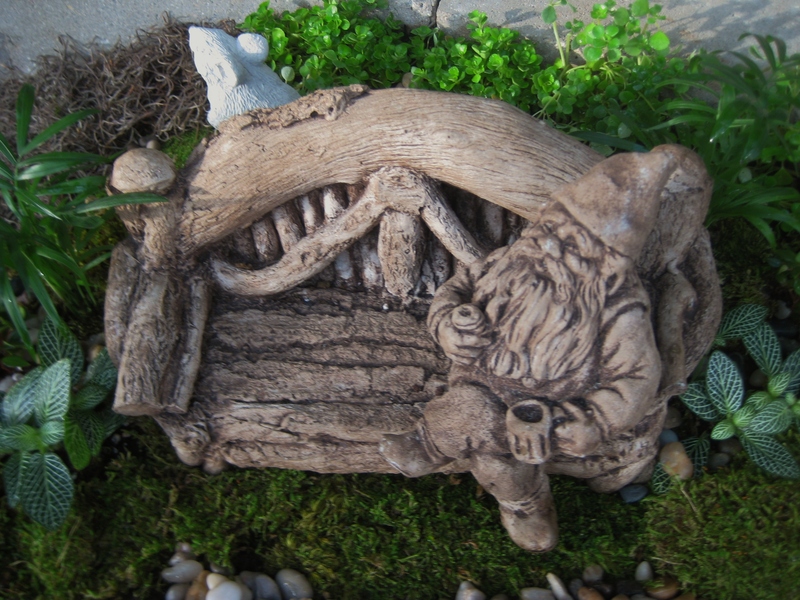 Purchase these items and more at Otten Bros. Garden Center and Landscaping. 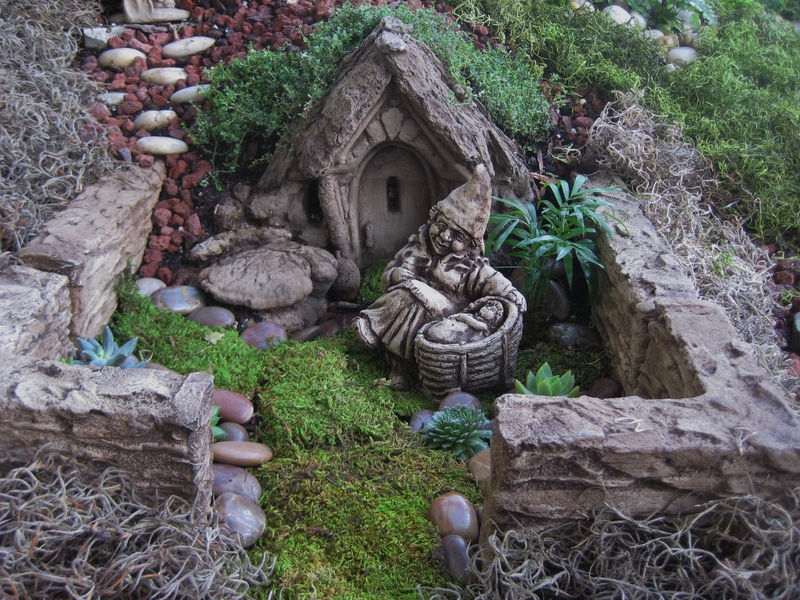 This miniature garden was built for gnomes and fairies who prefer a woodsy cottage environment. 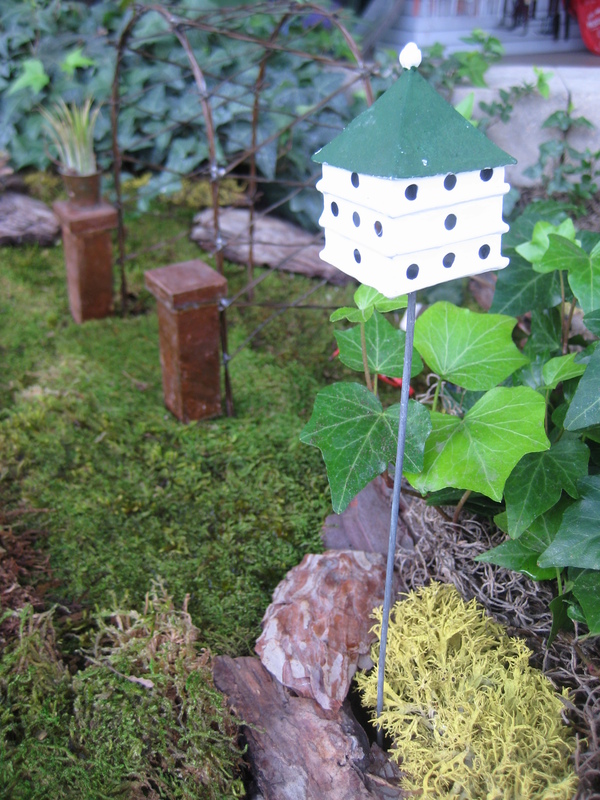 The landscape is heavily wooded with ivy and miniature ferns and fairy garden plants. 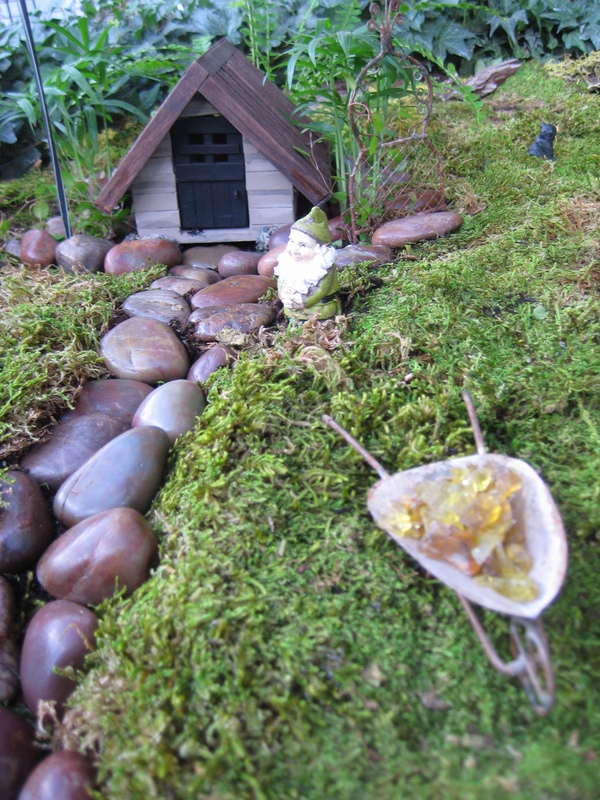 The ground cover is moss and wood bark with polished stones for a path. 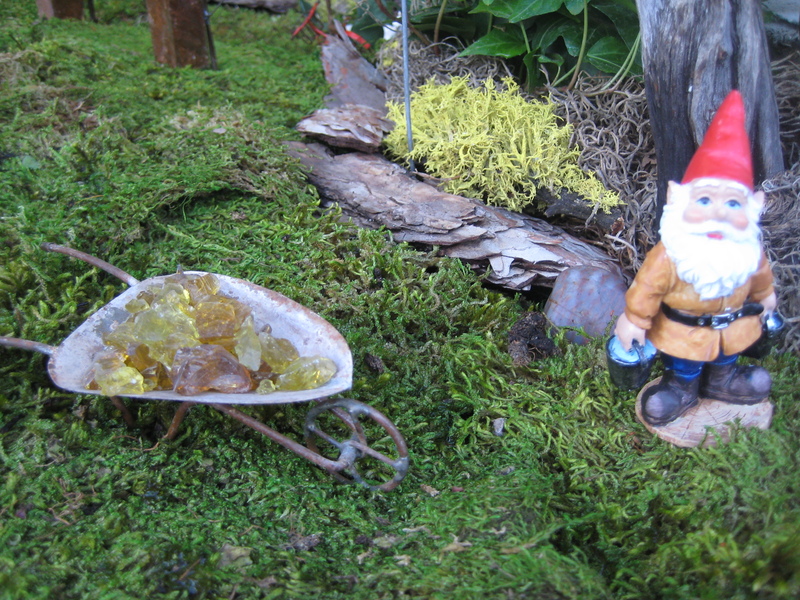 Gnomes populate this woods. They pan for gold as evidenced by the wheel barrow filled with shiny gold pieces. 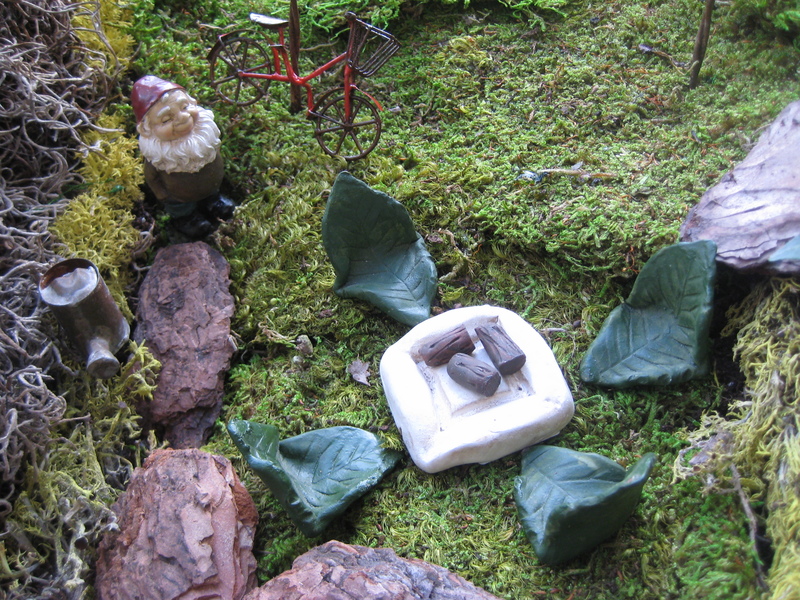 This gnome has ridden his bicycle down to a lovely spot to have a campfire in the woods. 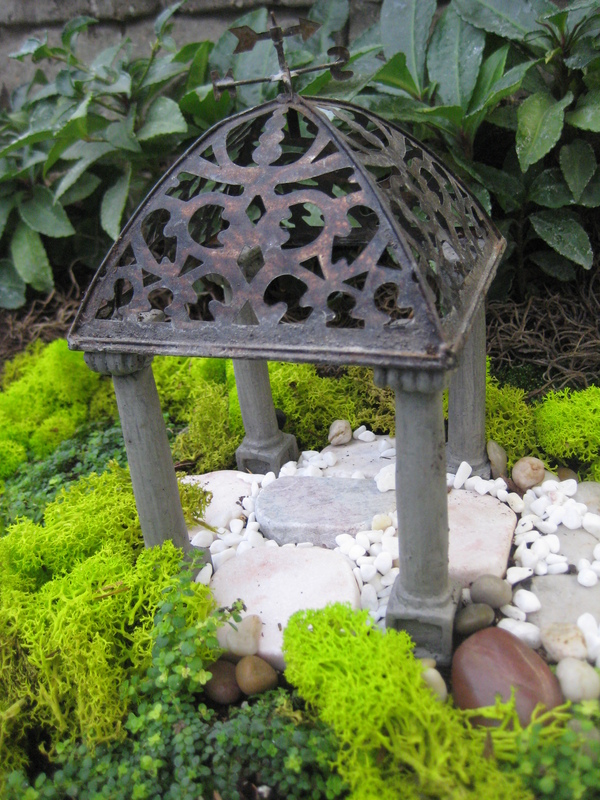 A wire arbor with pedestal entrance is a relaxing retreat. 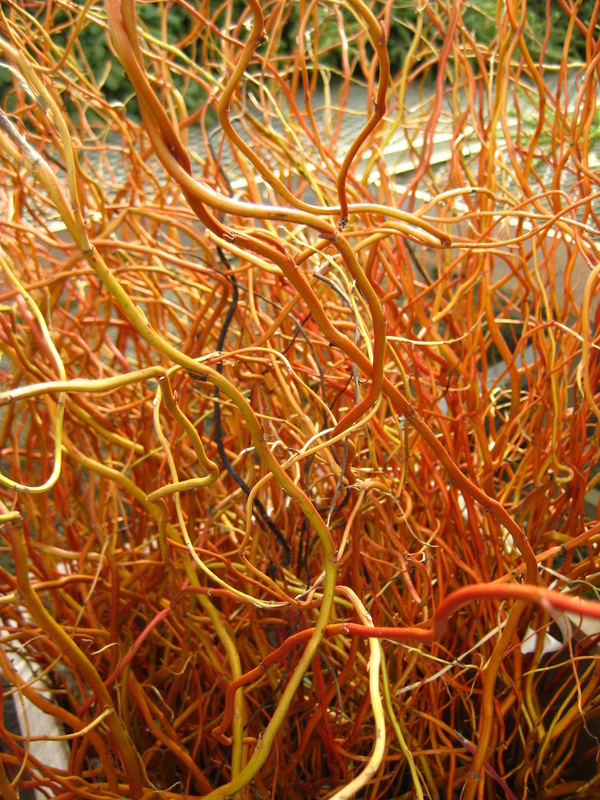 An air plant is a perfect decoration in a bucket on top of one pedestal. 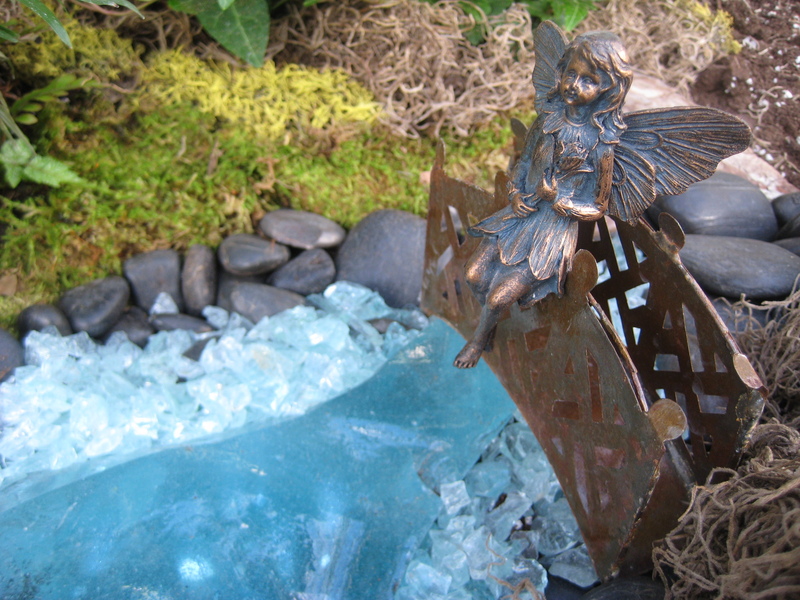 A beautiful blue glass pond offers a serene setting for a fairy to rest on the bridge. The gnomes have erected this Purple Martin house in the woods. 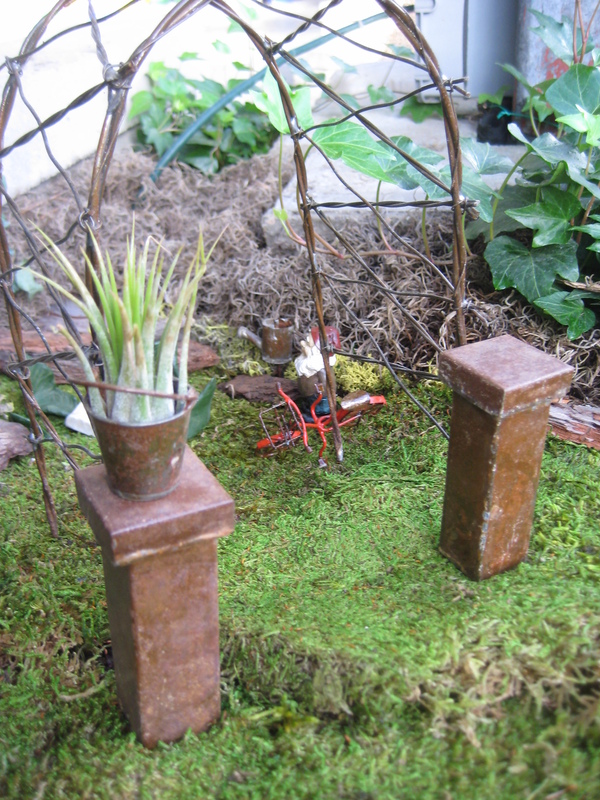 Lush plantings really create the scene for any miniature garden. 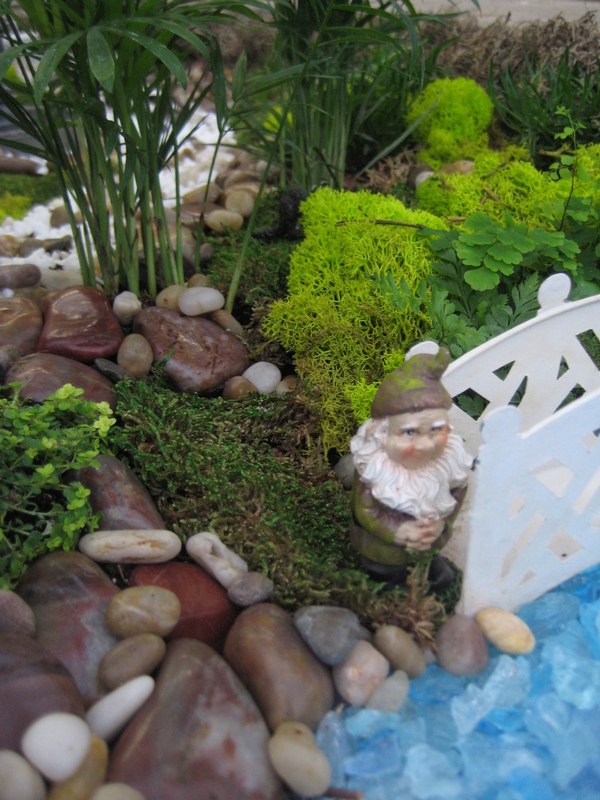 Use large size plants to create a wooded effect and miniature plants to accentuate small garden scenes. 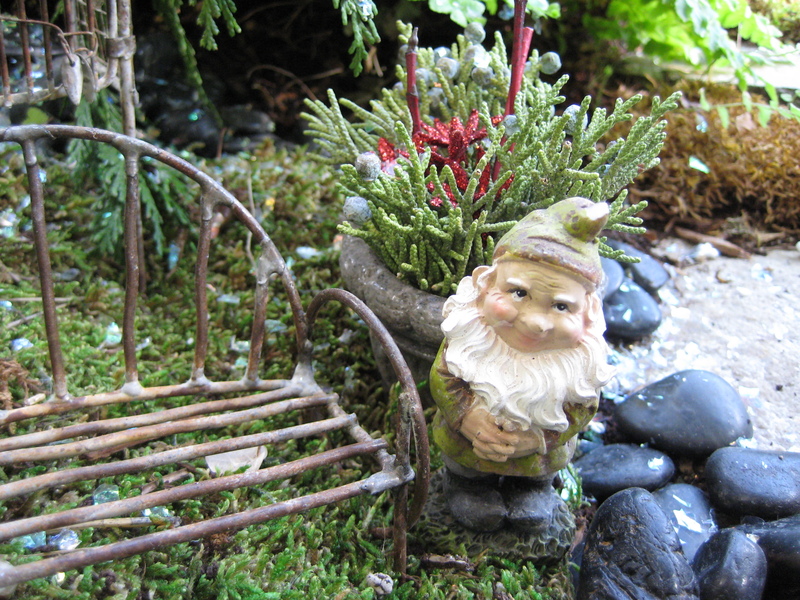 See these and other miniature garden accessories here. Cast stone door front and walls. 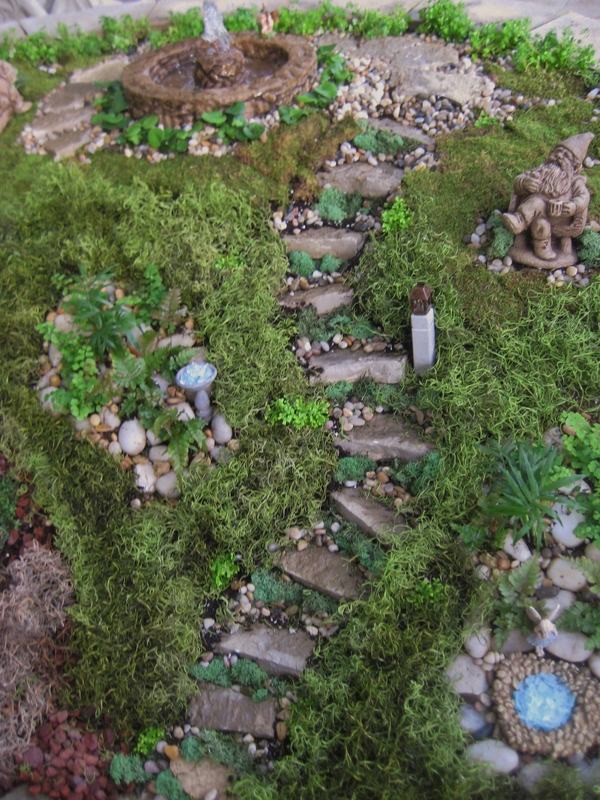 When building a miniature garden, begin by laying out the main focal features and hardscape first. In this case it’s a cast stone door buried in to the side of a hill to become a berm home, along with a stone wall creating a yard space. 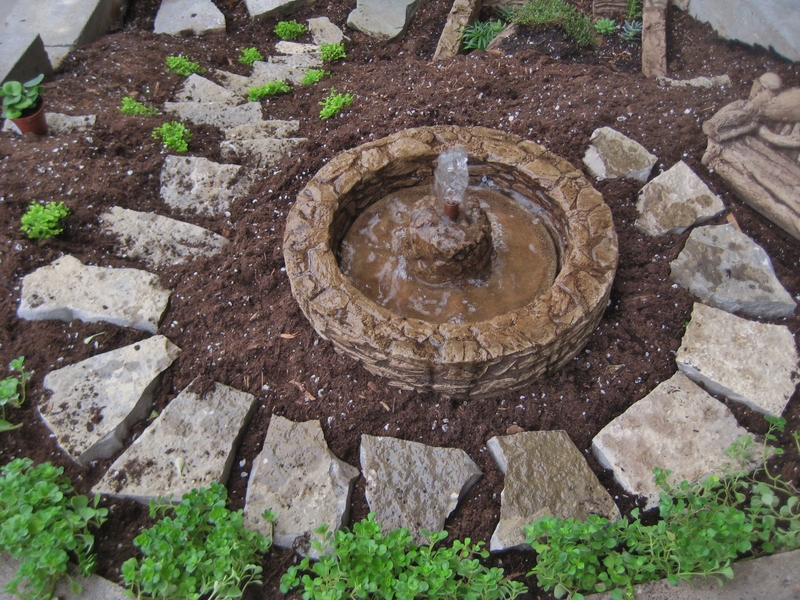 Additional hardscape was added when a limestone slab was broken in to smaller pieces and then buried in to the side of the hill to create a stepping stone path up to a fountain at the top of the hill. 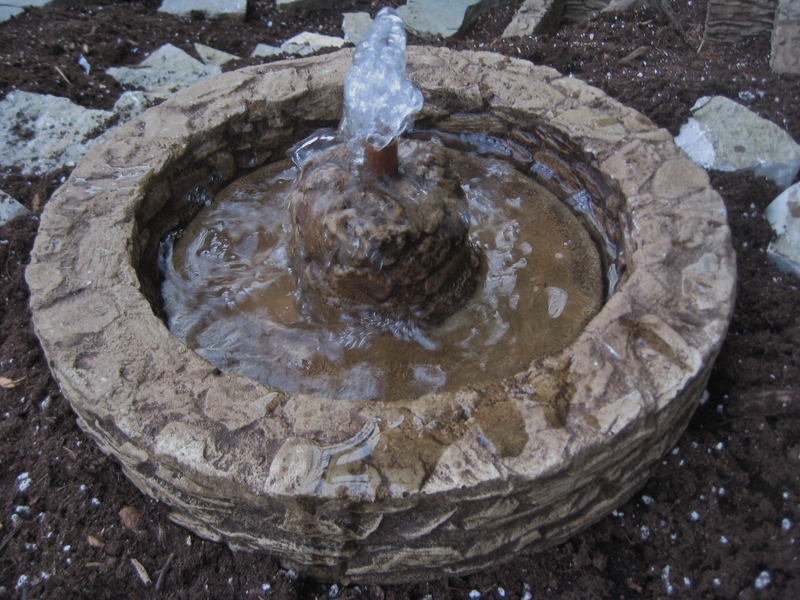 This miniature cast stone fountain placed at the top of the hill is the focal point of this hilltop garden. 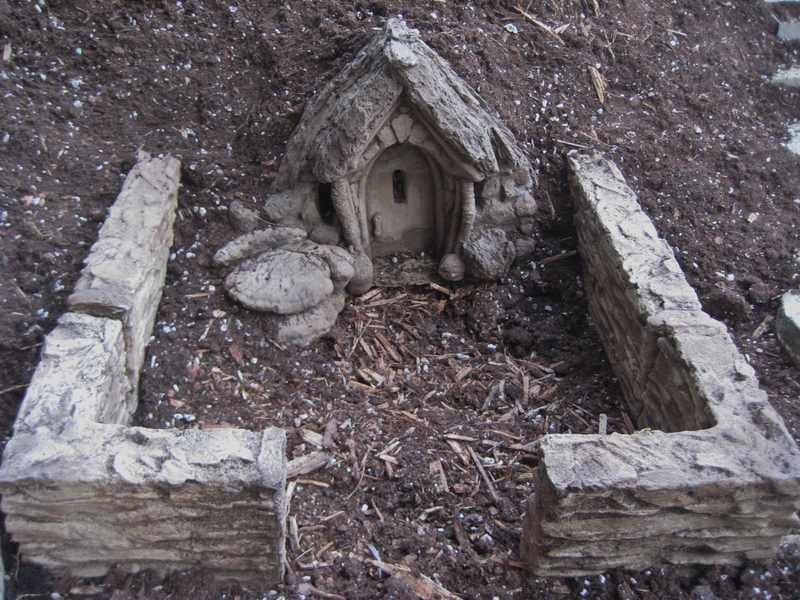 Once the hardscape is set, plant miniature fairy garden plants around the stone work as miniature shrubs and trees. 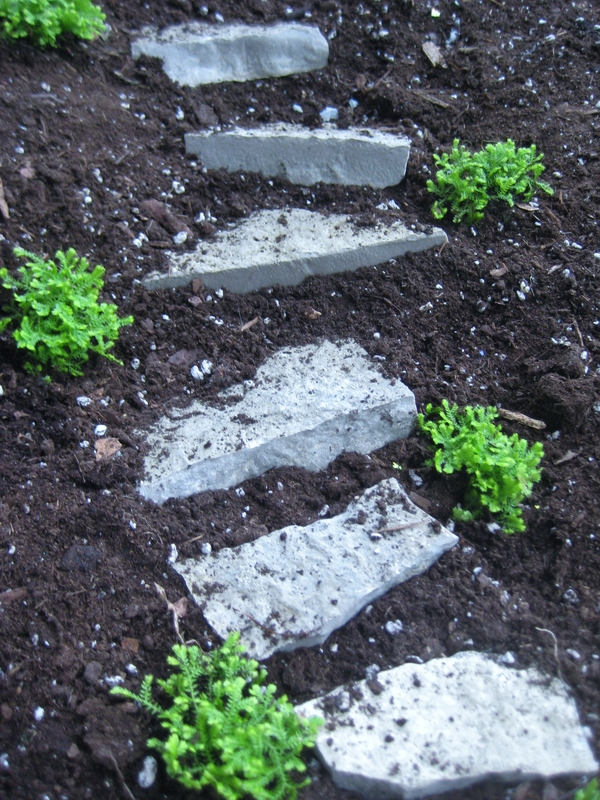 The plants soften the look of the stone and add interest. Use plants that are suited to the environment in which they will live; certain areas require plants that can handle a lot of moisture and some plants such as cactus and succulents prefer drier conditions. 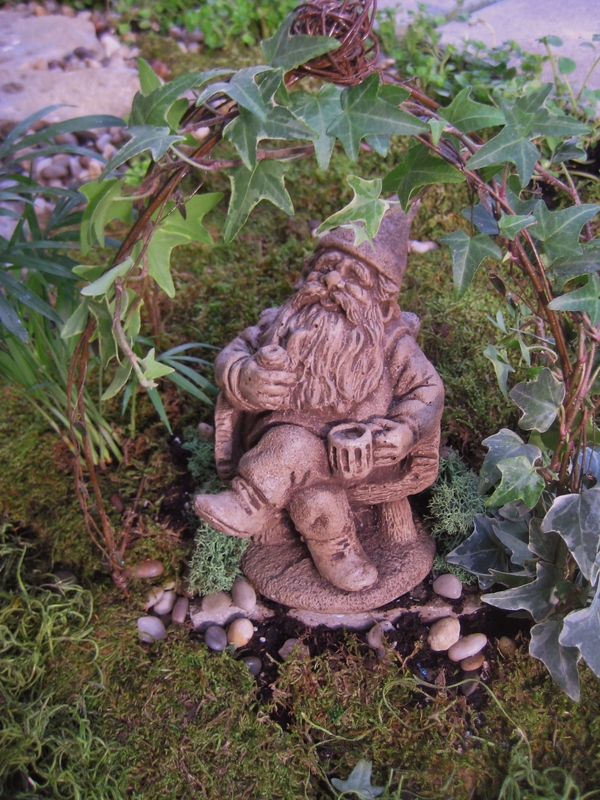 Once the main trees and shrubs have been planted, arrange furnishings and accessories. 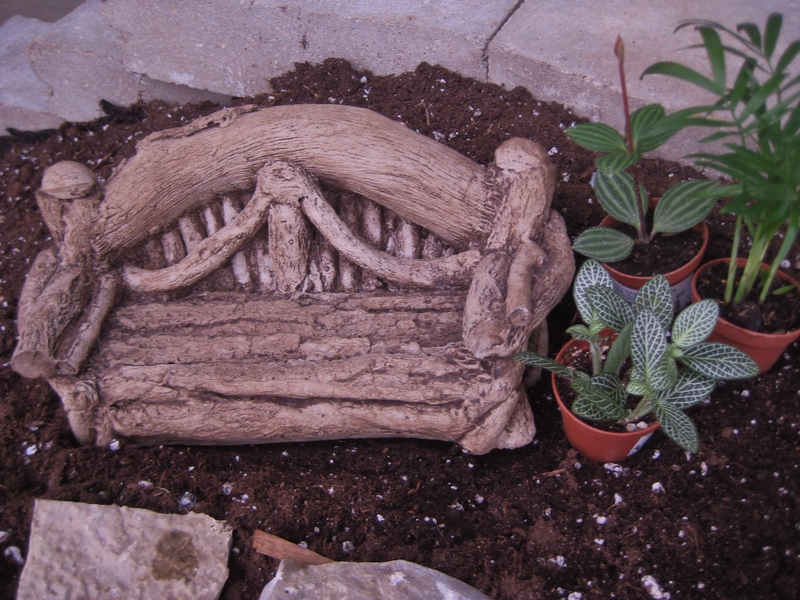 Set out plants around these pieces as well to get an idea of how the finished garden will look. 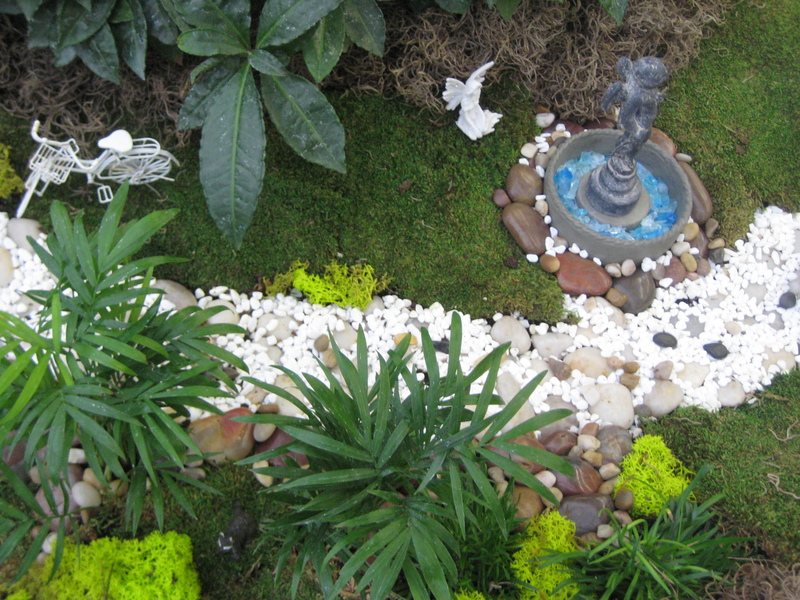 If you like the arrangement, plant it and add moss as ground cover and accents such as stones and pebbles. Spanish moss softens the outer edge of this retaining wall while preserved sheet moss creates a nice grassy lawn look. 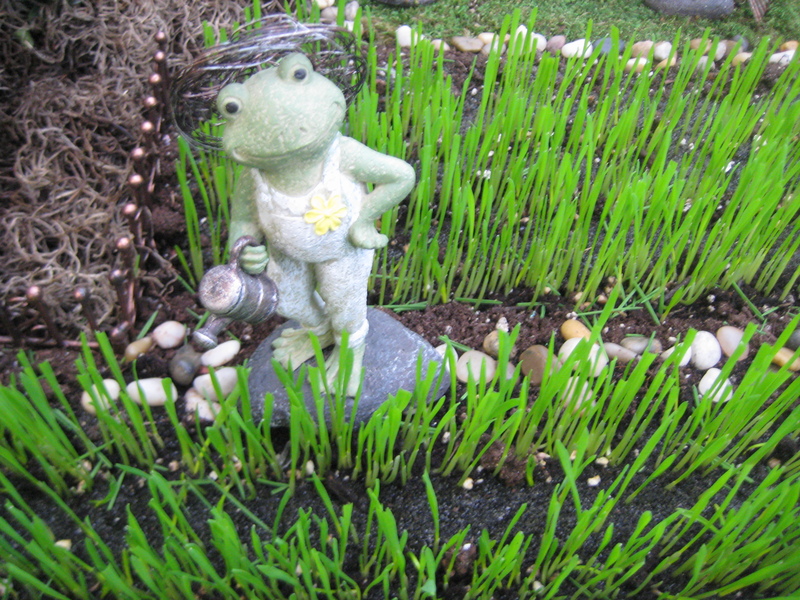 Gnome characters were added to complete the garden which has been planted with succulents and edged with polished stones. 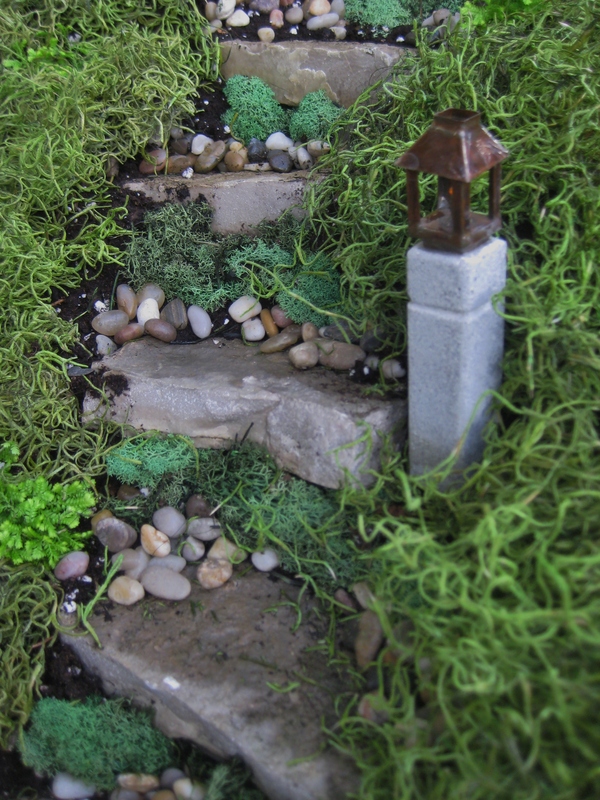 The limestone steps were tucked in with preserved green reindeer moss and pebbles while softened with Spanish moss as a prairie grass shoulder. 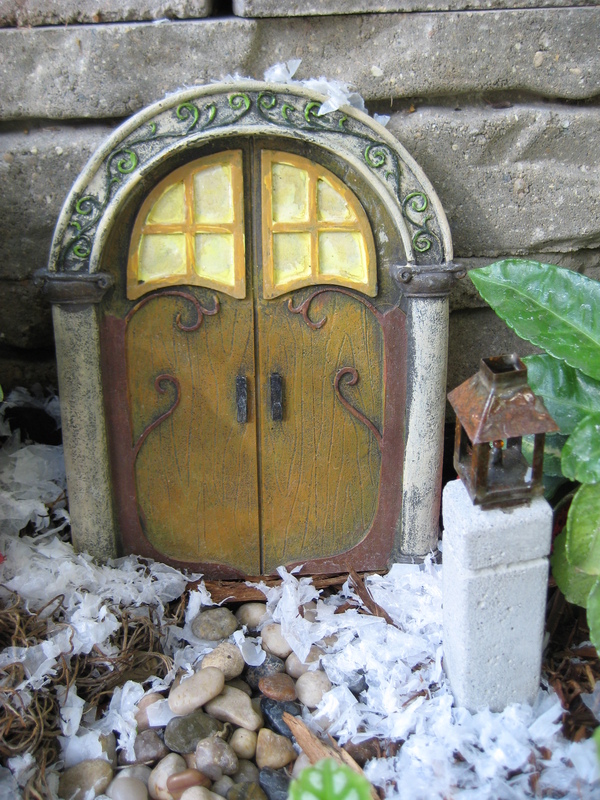 A cement post lantern accessorizes and lights the path for fairies and gnomes. Several smaller garden areas were cut in to the hillside. 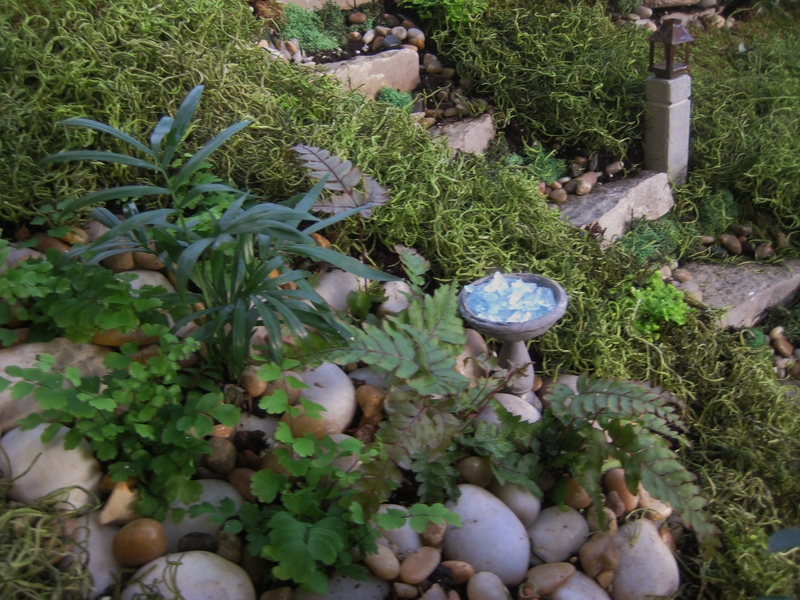 This garden was planted with ferns as a contrasting foliage and mulched with white polished stones. 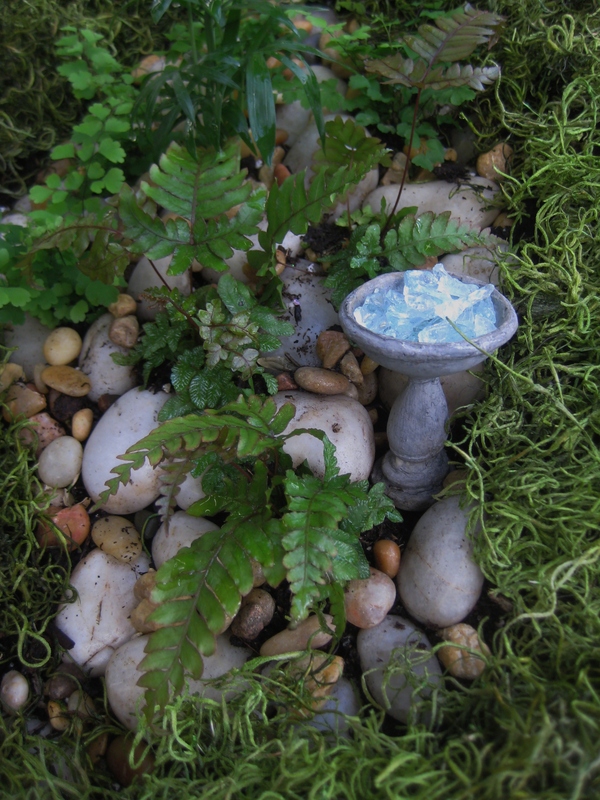 A concrete bird bath was added and filled with blue crushed glass. 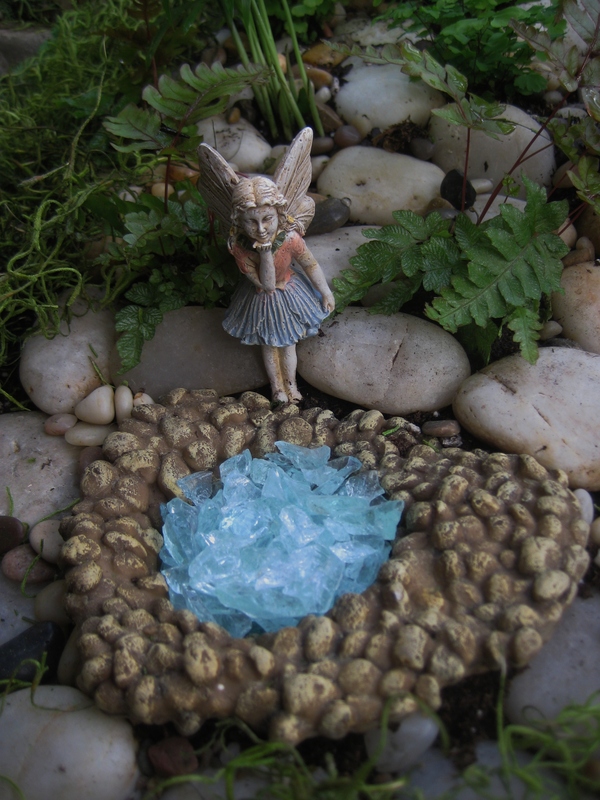 This fairy has found a small pond oasis tucked in to the hillside. 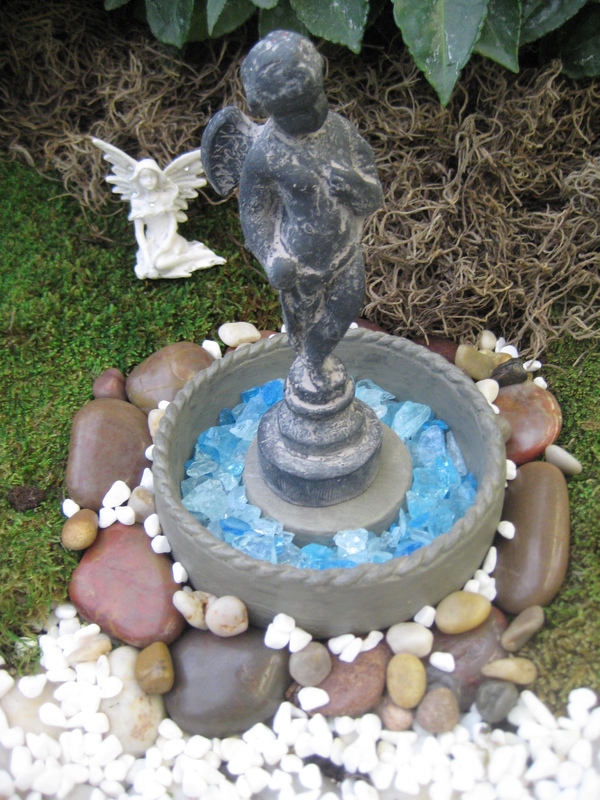 The pond feature is filled with aqua blue tumbled glass. 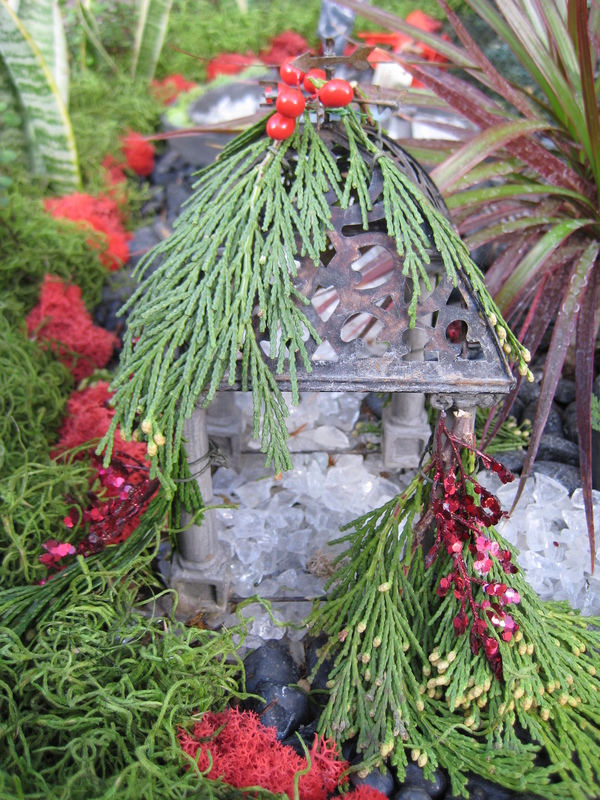 Each little vignette adds interest to the garden as a whole and helps to capture the overall miniature world feel we strive to achieve. 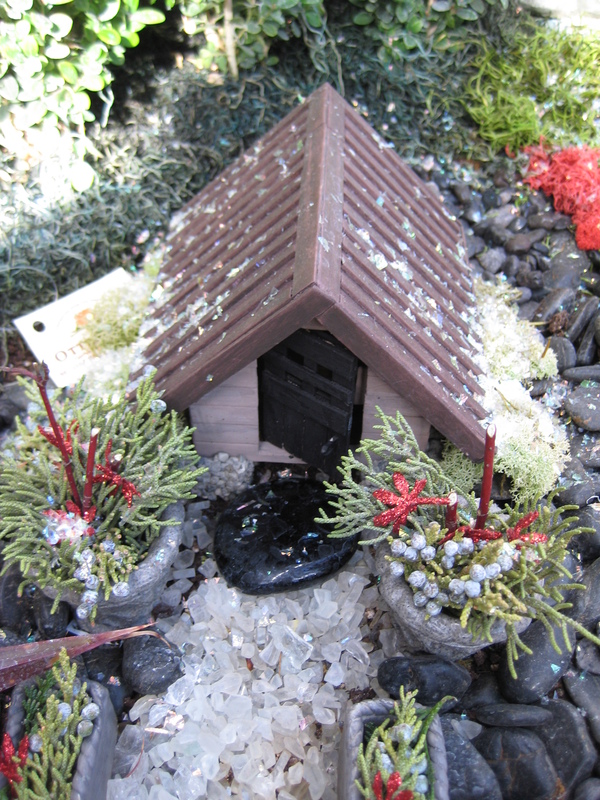 The characters you choose to add to the miniature garden are the final pieces and can be relocated in the garden as you choose. 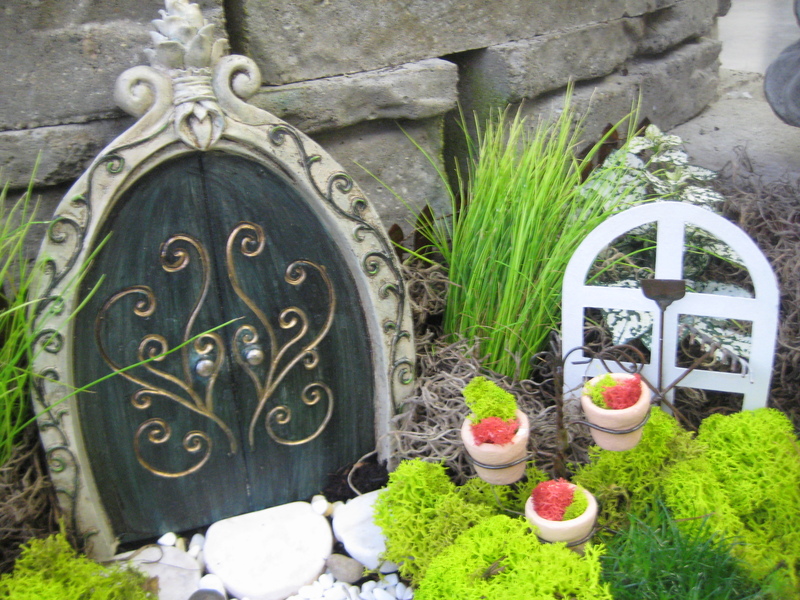 Children often like to move the fairies, gnomes and animals from place to place. 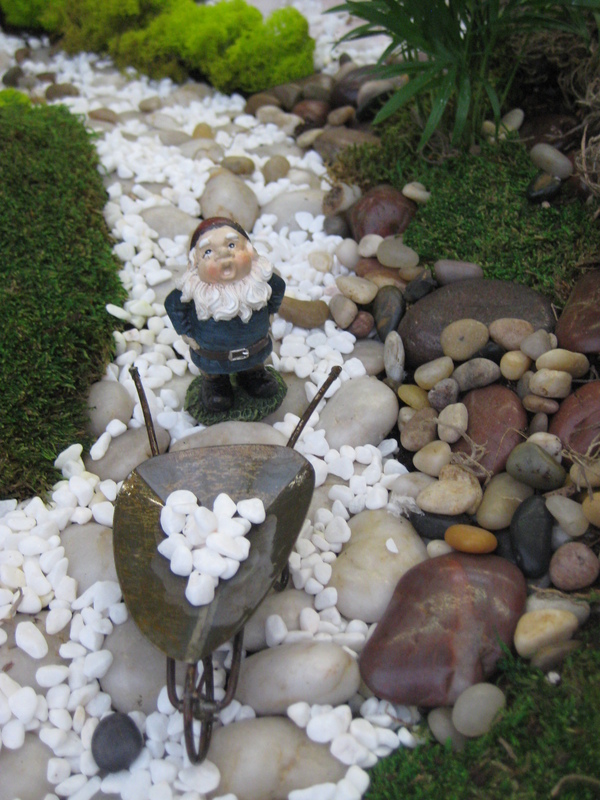 This gnome has a pebble path to his lookout perch above his stone hillside home. 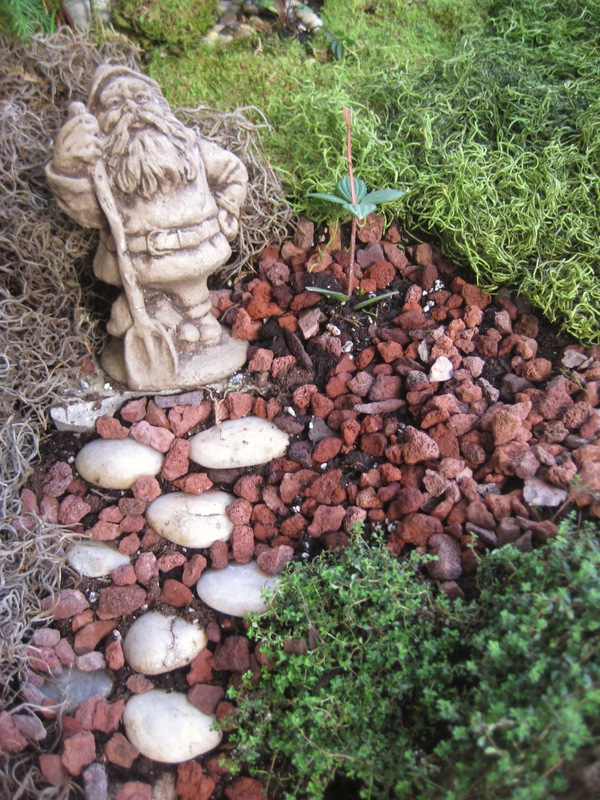 The garden comes together with a unified look if you first begin by laying out the hardscape, secondly plant around it, thirdly use ground covering such as mosses, and lastly add stones and accessories to complete the picture. 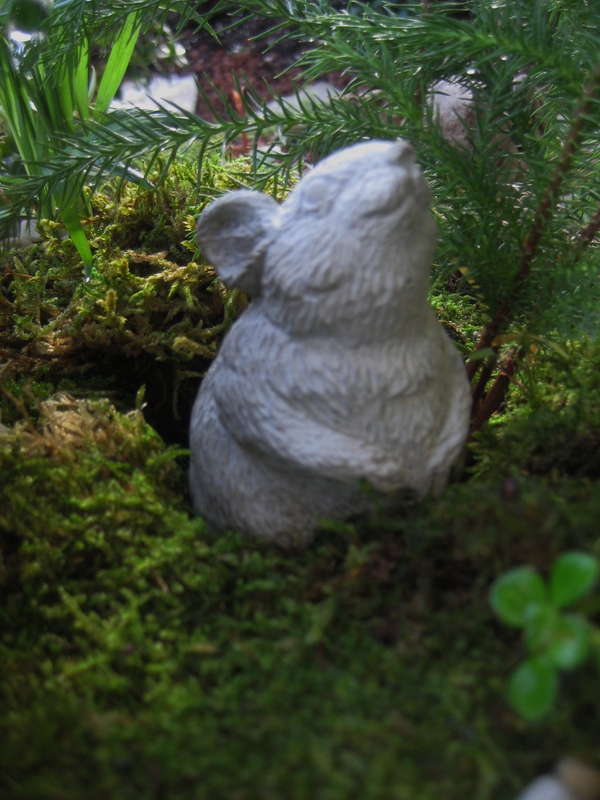 Even this mythical giant mouse doesn’t seem too far-fetched in this enchanted garden. 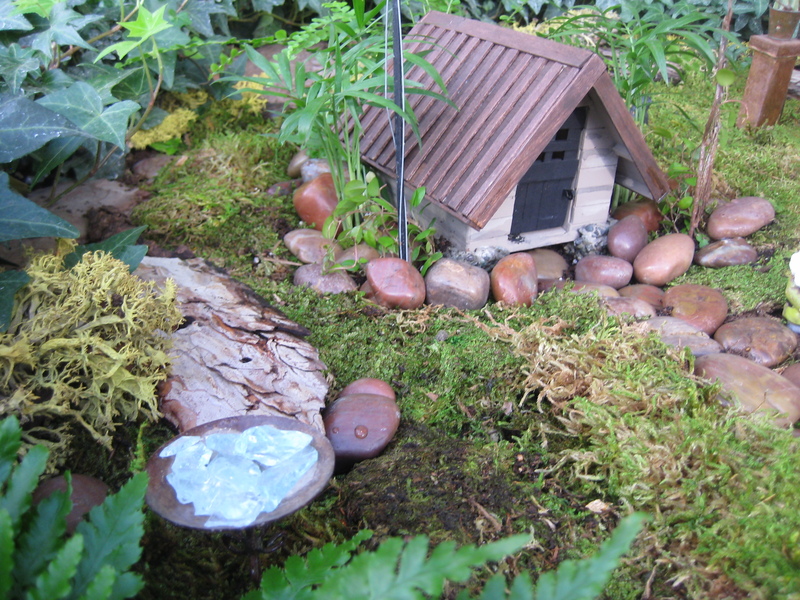 Visit our garden center for these pieces and more miniature garden hardscape and accessories. 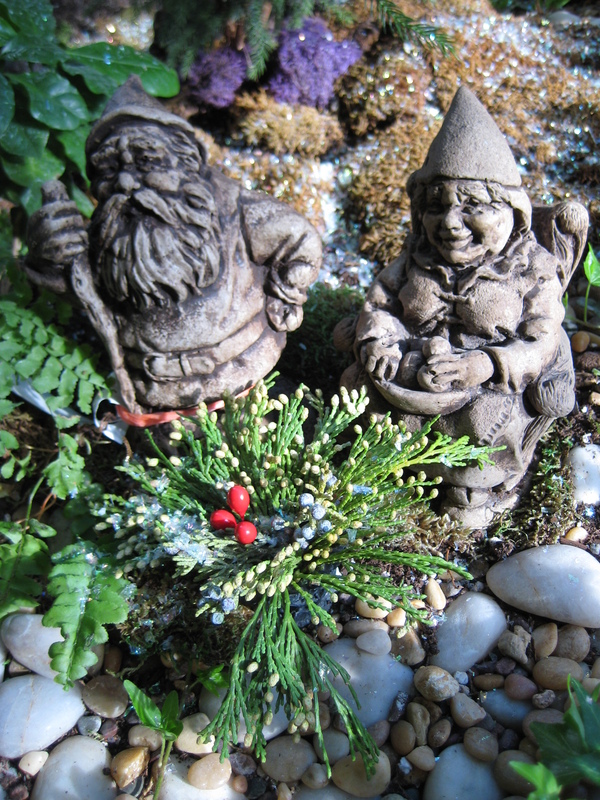 Fairies and gnomes love change just like we do. They enjoy decorating for the holidays. They hang wreaths on their houses. 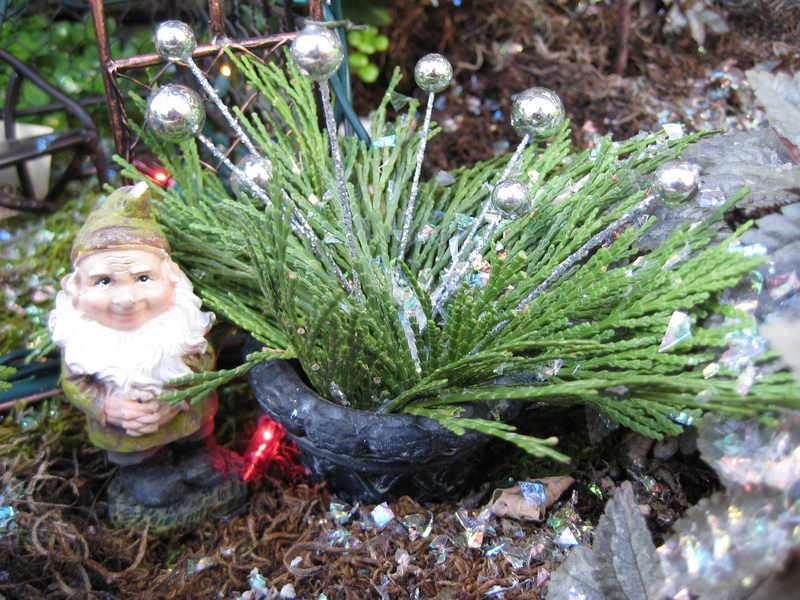 Fairies put lights on their trees. 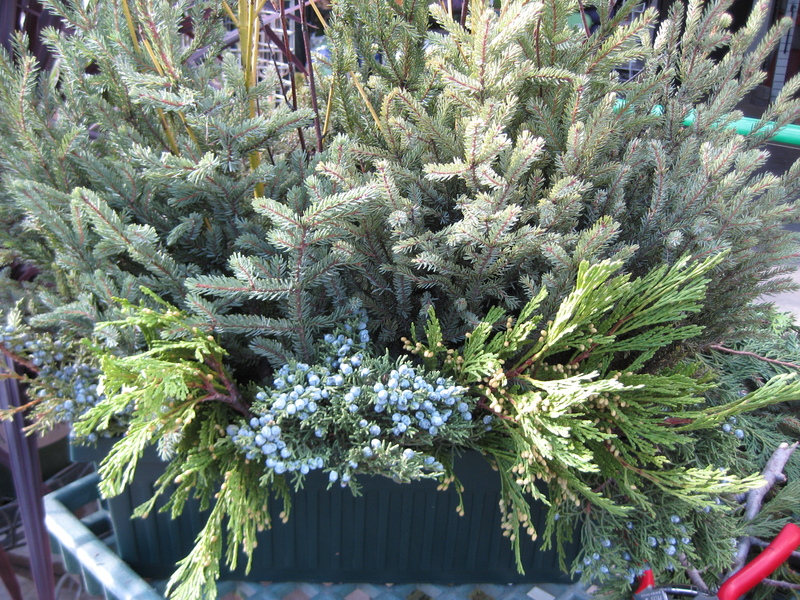 They change out their fall containers with spruce tips and greens. They love plenty of bling. 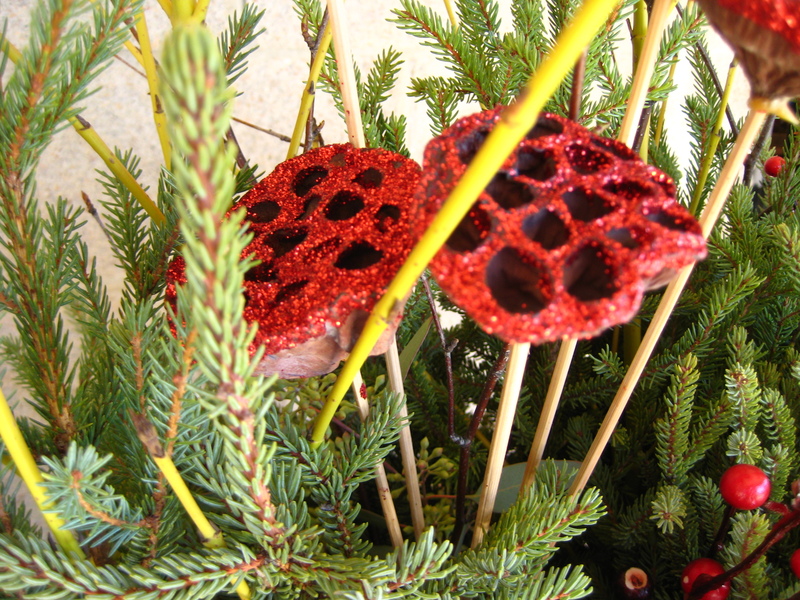 and decorate their window boxes for the holidays. and they’re ready for Santa to arrive. 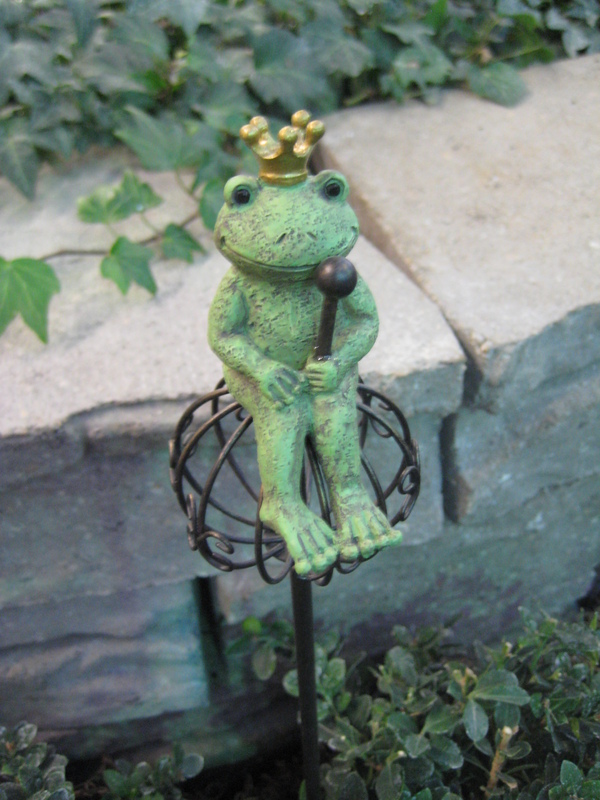 Find these miniature accessories as well as many others at Otten Bros. Garden Center & Landscaping or at Otten Bros. on line store. 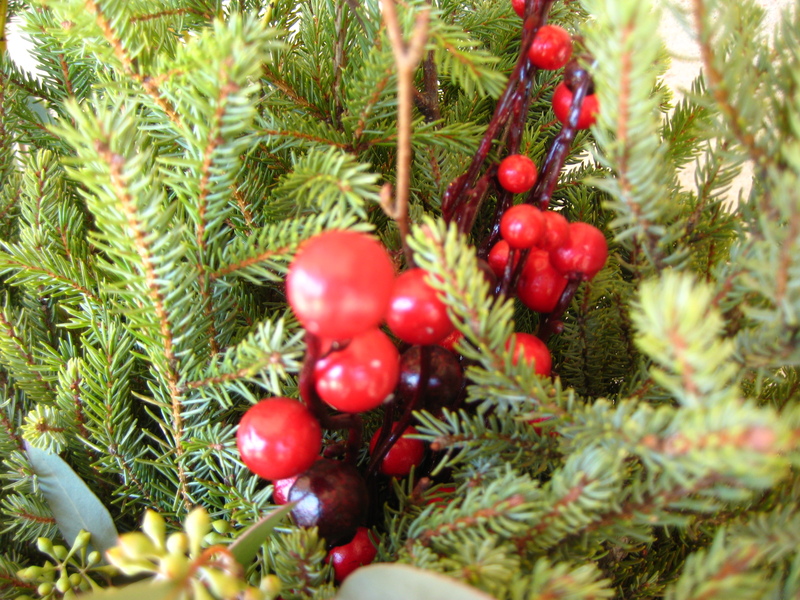 Beautiful containers, abundant spruce tips, copious greens, and plentiful bling create alluring and appealing holiday greeting decor. 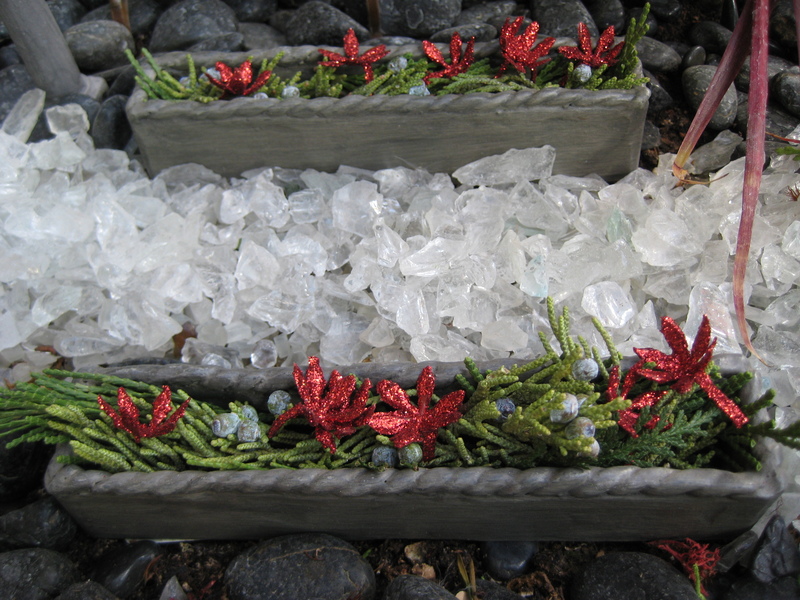 Follow this simple recipe to create breathtaking holiday containers. All of the product used here plus much more is available for purchase at Otten Bros. Garden Center & Landscaping in Long Lake, MN. 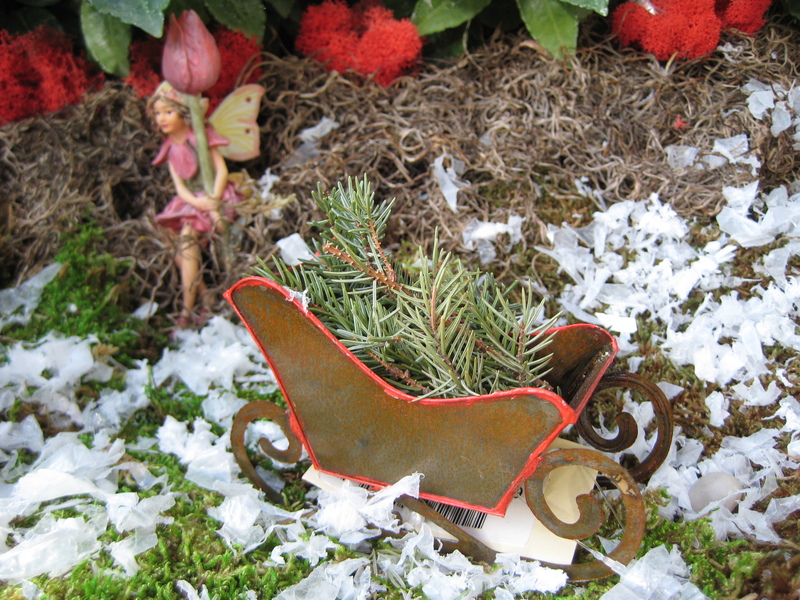 Begin by adding some wood chips to the bottom of your favorite container; about one-third of the container. 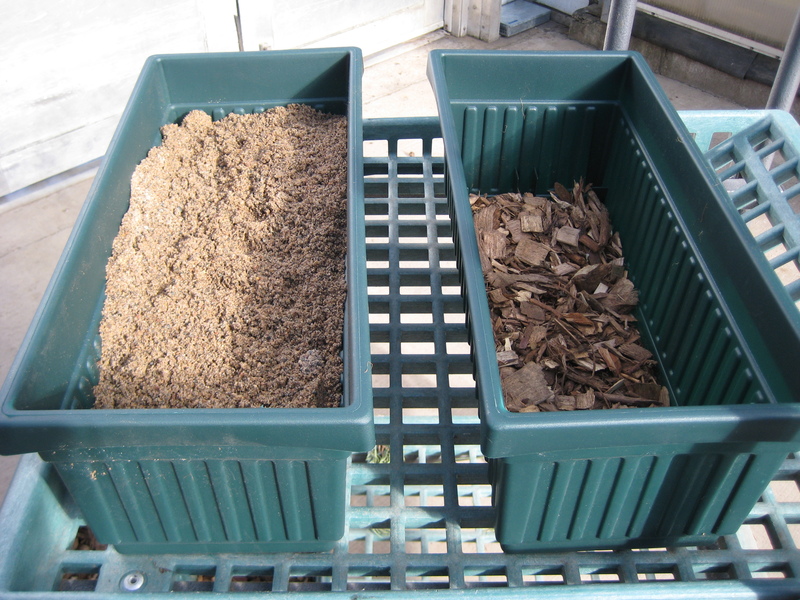 Then, fill the remaining two-thirds of the container with sand or soil. 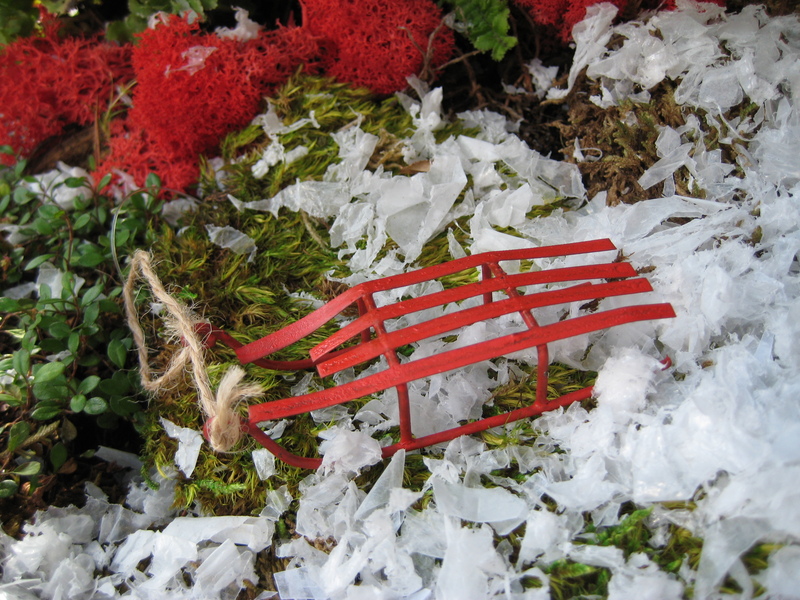 Window boxes being prepared for decorating with spruce tips. 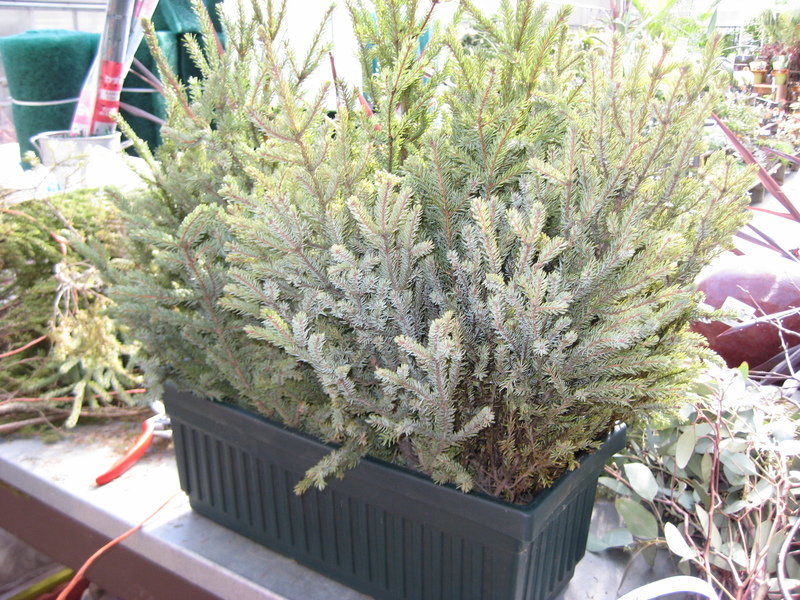 Make a fresh cut in the trunk of spruce tips and arrange in the container, tallest spruce tip in the center with two slightly shorter spruce tips to either side. 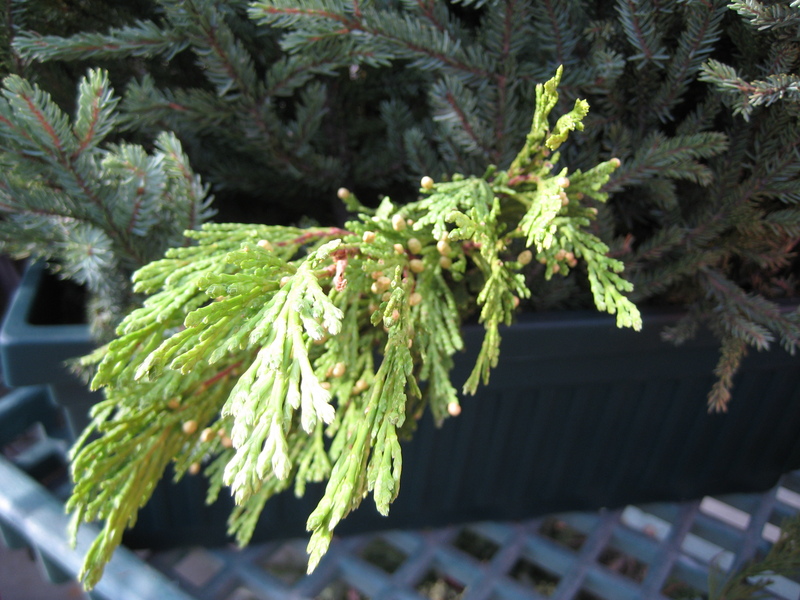 Begin with one taller spruce tip in the center and shorter tips to the sides. 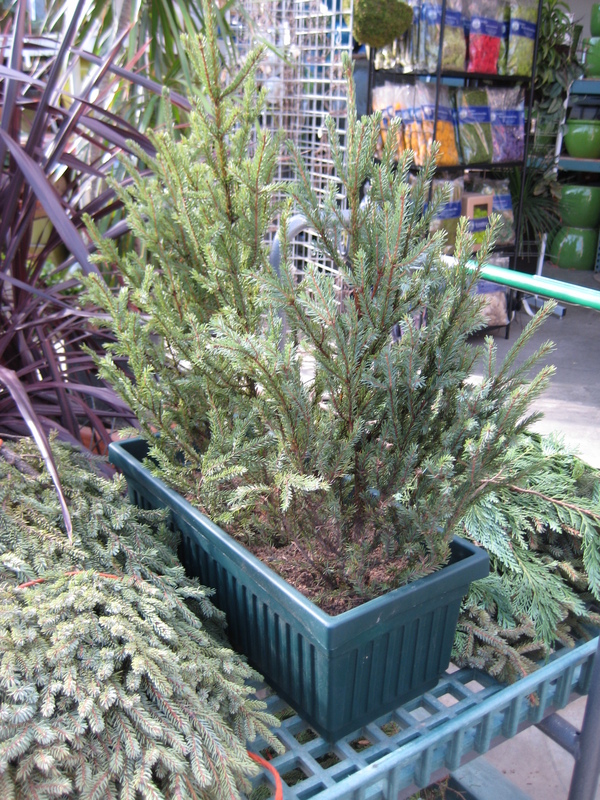 Fill in around the container with shorter spruce tips. 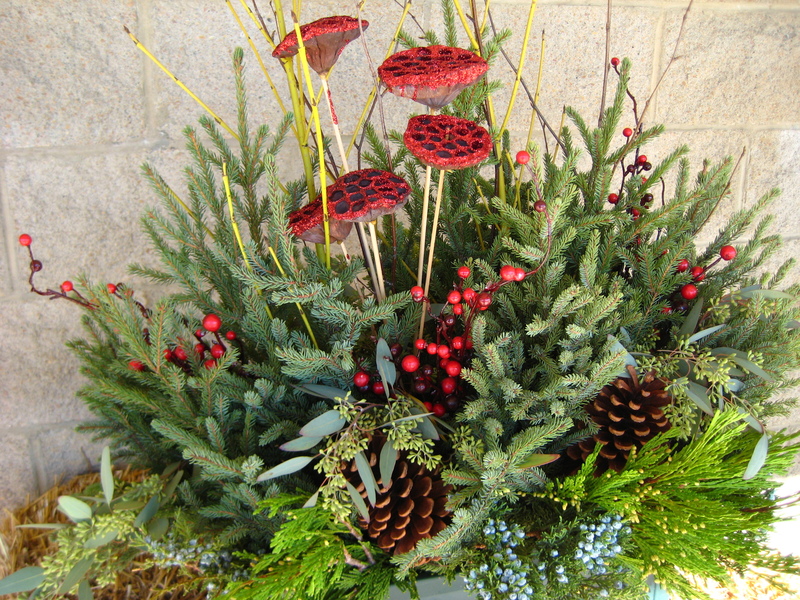 This window box used a total of 11 window box (1-2′ tall) spruce tips. 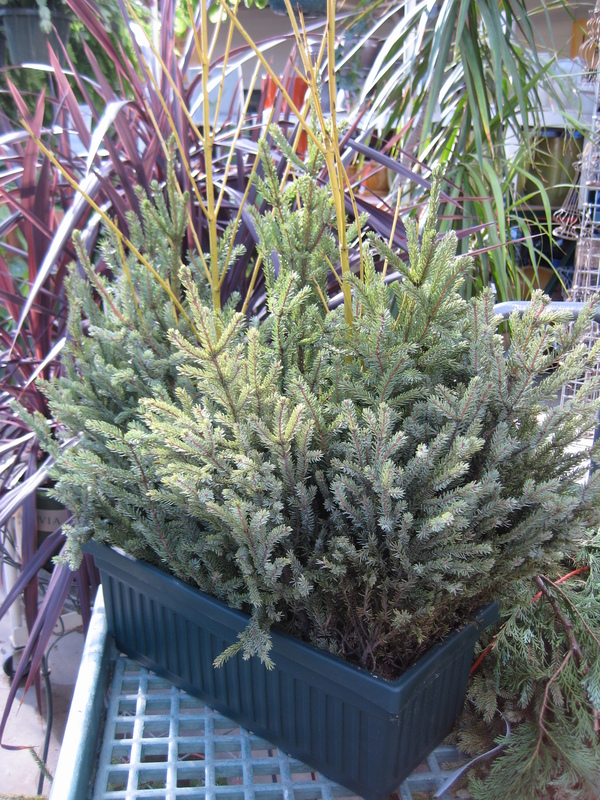 Container filled with window box size spruce tips. 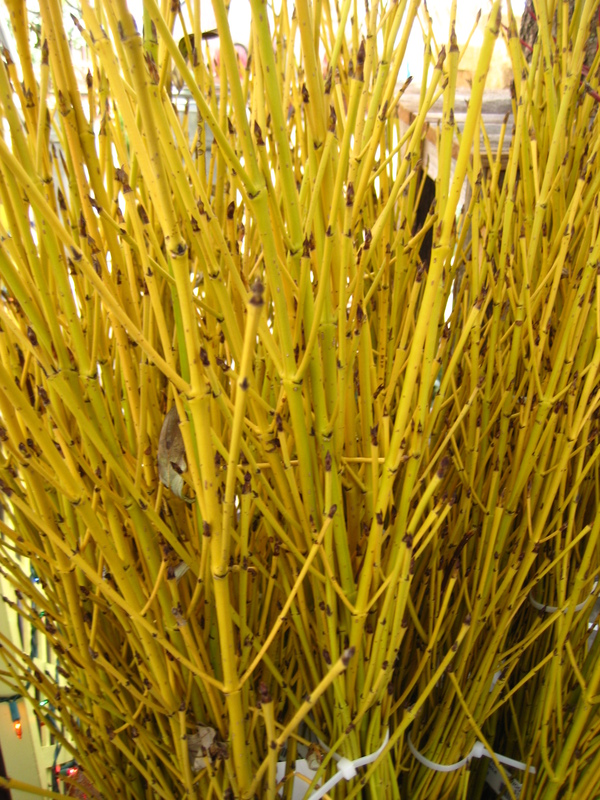 Yellowtwig Dogwood branches added for height. 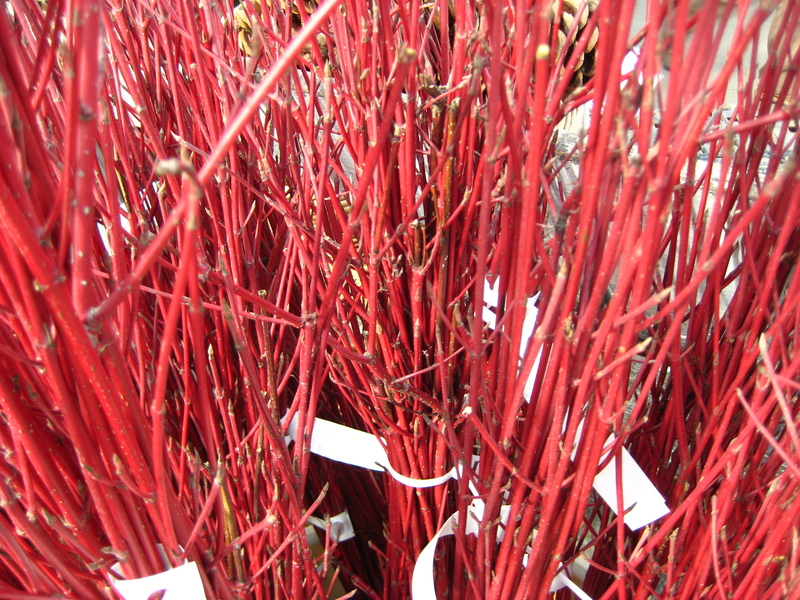 then added three Redtwig Dogwood in between and on either end for added height and color. 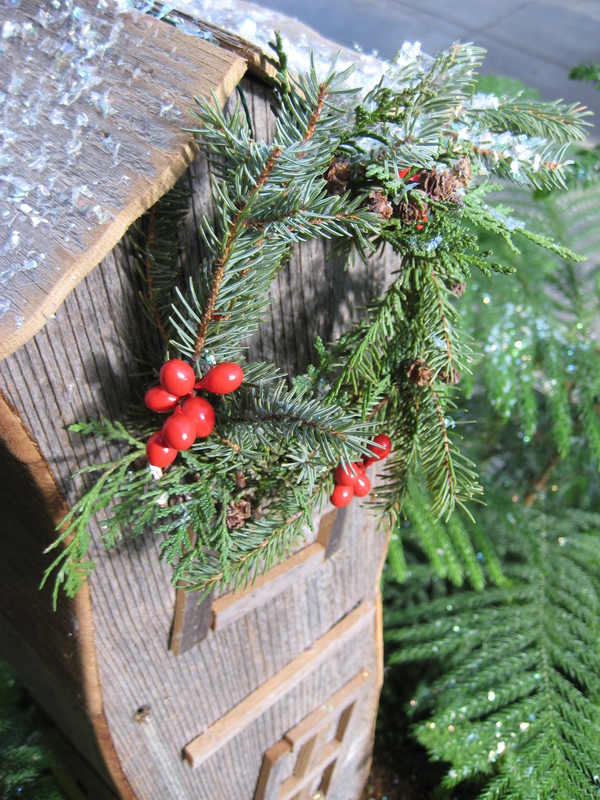 Incense Cedar boughs add texture and a lovely draping look. 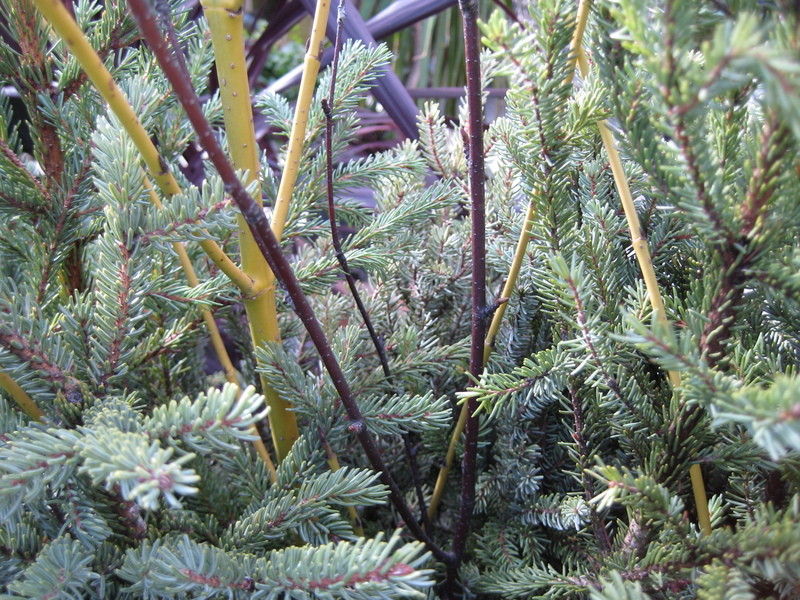 Blueberry Juniper adds texture and color. 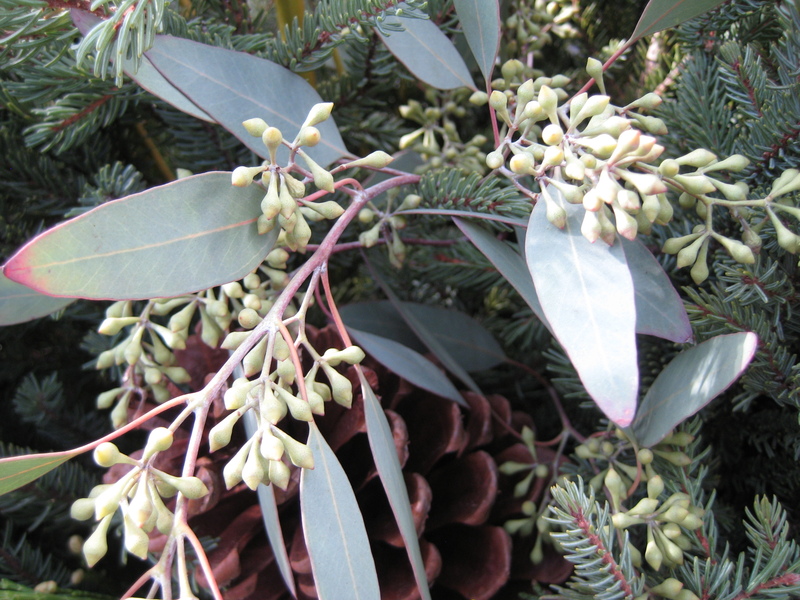 Add specialty products such as Seeded Eucalyptus and Pine cones. 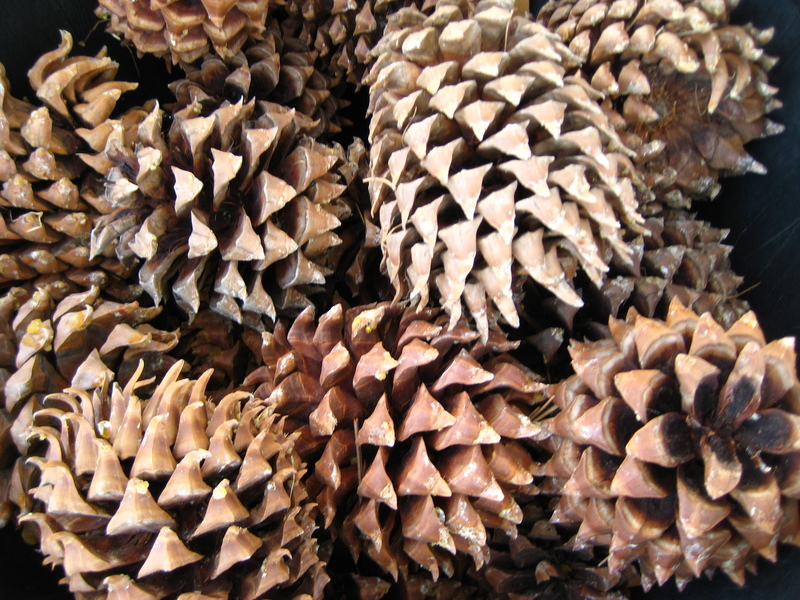 Seeded Eucalyptus and Pine cones. 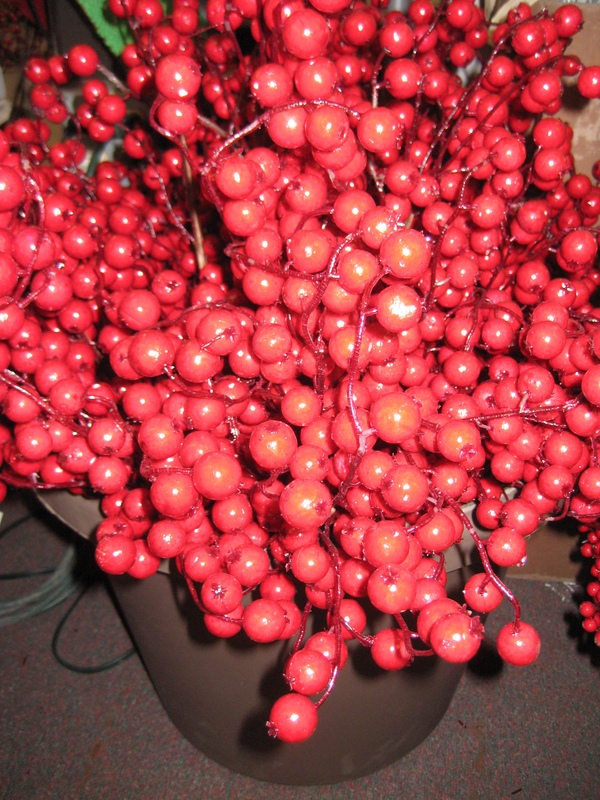 Water the arrangement and for extended life and freshness, spray with an anti-desiccant such as Bonide Wilt Stop. You can recreate this container or create your own design. 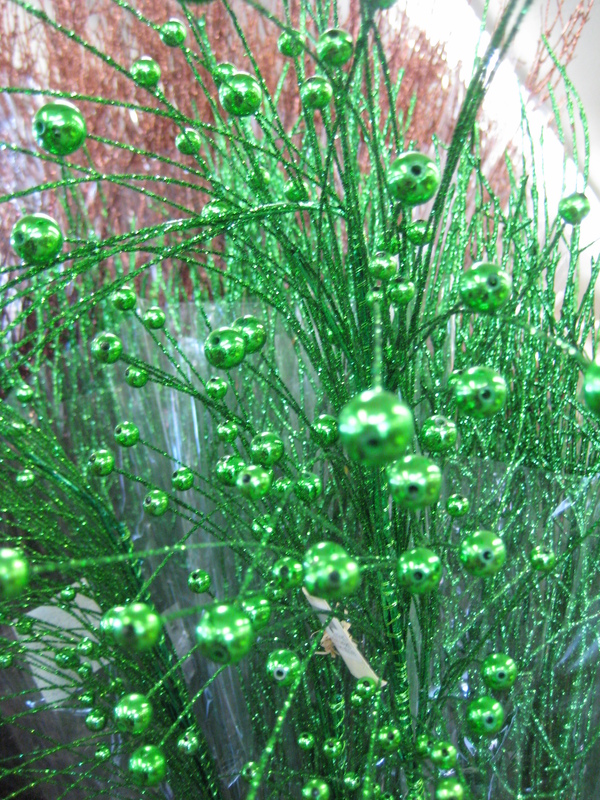 These greens and many others can be found at Otten Bros. Garden Center and Landscaping. 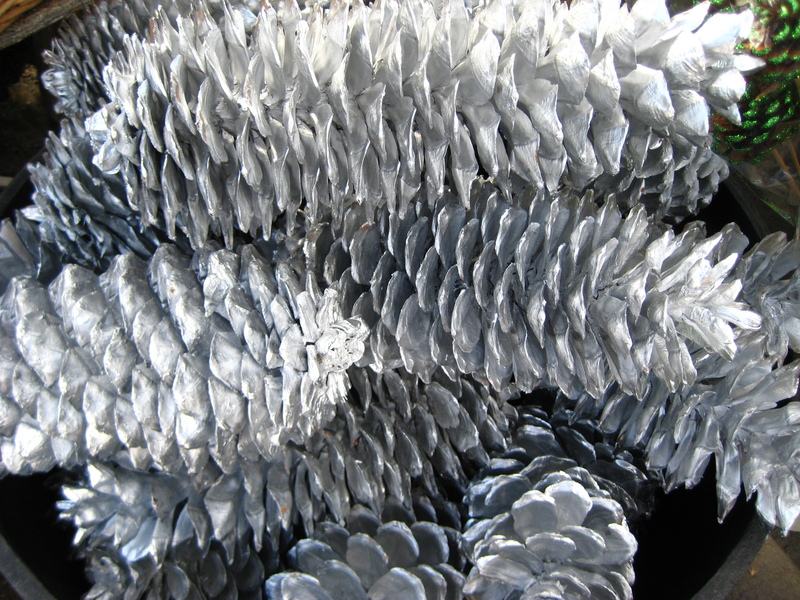 Shop from a fabulous supply of bling!